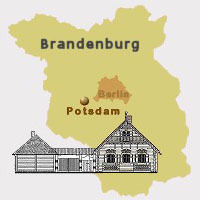 Alexandrowka is the Russian Colony in the north of Potsdam (Federal State Brandenburg, Germany, see photo on the left). It consists of thirteen wooden houses in Russian style, which were built between 1826 and 1827 on special wish of the former Prussian king, Friedrich Wilhelm III. Originally the colony was the home of the Russian singers of the First Prussian Regiment of the Guards. 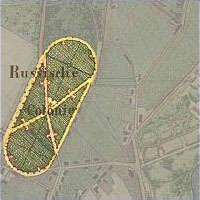 The blockhouses are surrounded by generous gardens (old plan see photo on the right). In the north of the colony the Kapellenberg borders, a hill on which the Alexander-Newski-Church was especially constructed for the Russian colonists. Once the colony has been built according to the village Glosovo near St. Petersburg in Russia. In 1999 the UNESCO (United Nations Educational, Scientific and Cultural Organization) has declared the Russian colony Alexandrowka as part of the cultural heritage of the world. Meanwhile only a few descendants of the former inhabitants live in the Russian colony. During the last decades before the reunion of East- and West-Germany there have been efforts to preserve the existing architectural core with the little money available. Nowadays, thirteen years after reunion, many preservationists, conservators and house owners are working together on the costly reconstruction of the monument. The buildings of the Russian village Alexandrowka shall be rescued and reconstructed in accordance to the original status. The way to Alexandrowka is descibed here. The present Website introduces the Russian colony to you. Its conservation is typically described for the house number 8 and house number 2. You will be able to riffle through the archives of the conservators and the house owner. During the last years the gynaecologist Dr. med. H. A. Kremer of Haltern am See (Federal State North-Rhine-Westfalia, Germany) has spent much time and money to undertake the ambitious project to avoid the final decline of two houses in Alexandrowka. The house number 8 already has been reconstructed as a faithful copy, house number 2 has followed in 2005. Dr. Kremer’s real motive, ideas and his commitment are presented as well as the „Potsdam Foundation Kremer„. You are able to order a CD-ROM (in German) with more information about Alexandrowka via email. In January 2005 Dr. Kremer has opened the modern museum (Museum Alexandrowka) in house number two. In the groundfloor the visitors are able to study the living conditions of the Russian singers in their blockhouses in the nineteenth century. Opening hours and prices in English can be find under Öffnungszeiten.